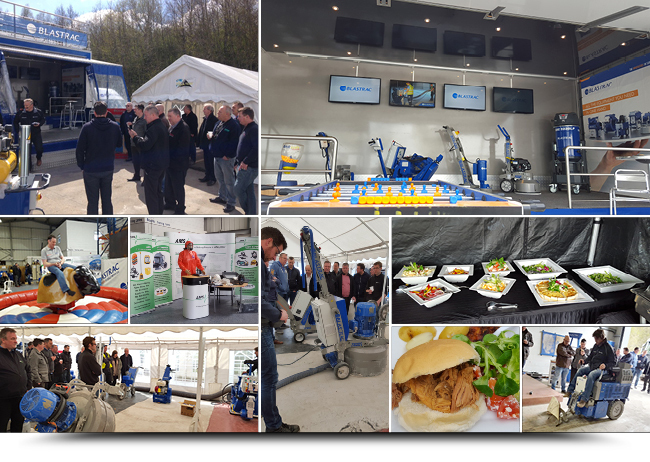 On 28th April 2016, Blastrac opened its facility up to showcase our promotional truck and our full range of machinery and new products. Demonstrations were held throughout the day using all our technologies, including shot blasting, stripping, grinding, polishing and our dust collection systems. Our new remote BG-250RS and the BMP-4000 milling machine were demonstrated as well promoting our recently launched F1 quick release changing system for single disc grinders. Once the demos were finished, customers were able to have a go themselves. Our distributor for the asbestos industry, Air Management Systems was also present with their welfare and decontamination units and an indoor exhibition promoting their face masks and other products in their portfolio. Our team of experts were present to answer any questions and provide any necessary advice. Refreshments were on hand, including an excellent Hog Roast as well as entertainment. We would like to thank everyone who attended and those who competed in the F1 simulator and Rodeo Bull competitions. All in all it was a fantastic turn out and the feedback has been second to none. Should you need any further assistance, please do not hesitate to contact the office.